I have a project where I have about 1/3 of the project area which is faulted. I am trying to get the 2-D models and surfaces I create for my stratigraphy model to interpolate Fault Polylines. I entered fault trace data into the "Gridding Options," Fault tab/ table and when I process there is no change made. I have tried several different ways to correct this but I cant seem to get the fault polyline to even appear on a 2-D map. It looks like the northern third of the map consists of a down-dropped fault block. You may need to turn on the display of fault polylines in the Diagram Options menu item on the left side of the menu. If this procedure does not resolve the problem, backup your project with the File | Backup Database menu command and send me the ZIP file. Files between 10MB and 130 MB can be uploaded to http://rockware.com/upload/ . Larger files can be shared via your Google Drive, Dropbox, or other option. 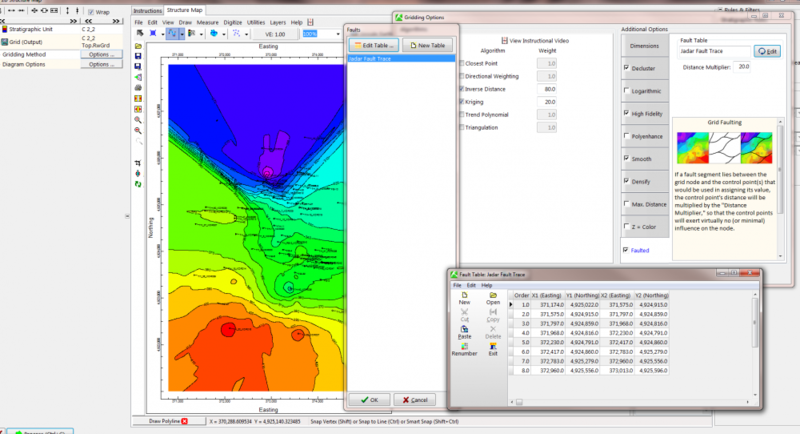 Include a copy of your RwGrd used to create the contour map and I will take a look. determining if data gaps between holes need to have "Fake" borings inserted as control point to restrain RW algorithms from interpolating surfaces across areas where the unit does not exist. Just to clarify I have tried many different settings and options in RW to achieve this with no success. The ultimate production of these surfaces needs to be as accurate as possible as the surfaces will be entered into other models for the project. You may need to move the fault. I found two wells north of the fault that have the C 2_2 unit present. Thicknesses are 54.3 and 78.0. One way to handle zero thickness Stratigraphy units is to add the unit with the same top and base depth into the wells where the unit is absent. When you create a Stratigraphy model, you can automatically null out the unit when it gets below a specified thickness. See the help topic titled Missing Formations. The Borehole Manager has the ability to insert missing formations with the Striplogs | Fill In Missing Stratigraphy menu command. Thanks for the input. I have moved the borings, turned off holes north of the fault, and inserted missing stratigraphy. The data plots much better now after doing that. I appreciate the input on this. I'm glad that you were able to resolve the problem. Thanks for letting us know.